When I finally got around to quitting my day job two years ago, my business was already generating significantly more revenue than what I was making at my day job. Frankly, I waited too long to quit my day job. I recently had lunch with an entrepreneur that has an e-commerce business who is currently in a similar situation. His business generates slightly more revenue than he earns at his day job, but like me he had a relatively cushy day job and the additional income was pretty nice. He is respected at his place of employment and doesn’t hate the work that he’s doing on a daily basis. Like I did, He is operating under the assumption that his income will go down in the short term if he goes all-in on his e-commerce business. What I failed to realize (and what he now fails to realize), is that your day job will always take up your best energy and prevent you from working on new projects and ideas that will substantially increase your income. When you’re working 40 hours per week for someone else, you probably just have enough time to conduct the day-to-day operations of your business. You don’t have extra time to work on business development and growth projects that could be game changers for your business. When you quit your day job, you suddenly have 40 hours of additional time per week to work on blue sky projects that may not have an immediate short-term return on investment but could yield substantial results down the line. 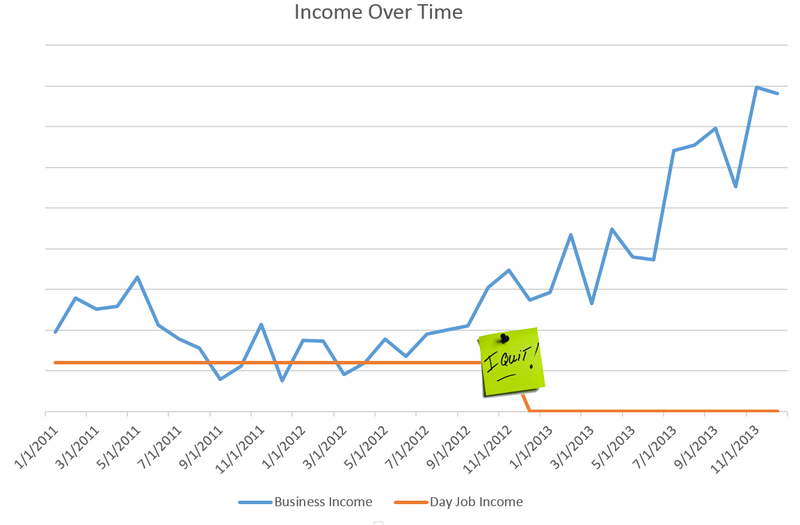 While there was a short-term drop in my income, I was making more than I was previously within six months of quitting my job. The numbers only got better from there. After I put in my resignation with my former employer in November 2012, I suddenly had a lot more free time to work on growing my business. Instead of just keeping my head above water taking care of customer service and other operations tasks, I had a lot more free time to work on new projects. I immediately began to pursue several new projects that have since taken off. I started working on my press release distribution business in December 2012. I revamped all of my opt-in mechanisms and display ads in early 2013. I started ramping up the volume of content my financial news business produces. In August 2013, I started GoGo Photo Contest with a couple of friends. By putting in a ton of work into a lot of new projects (many of which failed miserably and a few that were game changers), I was able to replace the income my day job provided and much more. 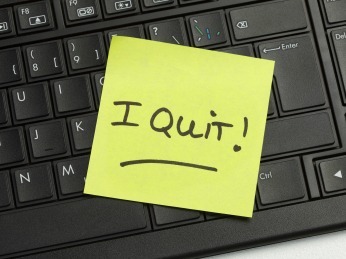 My baseline recommendation is that you should quit your day job when your business provides enough income to pay for your monthly living expenses. At that point, you won’t have to worry about making bad deals or pursuing projects that you really don’t want to just to make enough money to get by at the end of every month. You have also proven that your business is economically viable and can create an income that sustains your lifestyle. When you make the leap, you’ll have substantially more time to work on new projects and growing your business. Even if you think that you don’t have a ton of different ideas to pursue once you make the leap, you’ll have plenty of time to research and come up with things to try. Good. My goal is to get everyone with an entrepreneurial spirit to quit their day jobs (at the right time) and pursue their dreams! Knowing the right time to quit is hard.